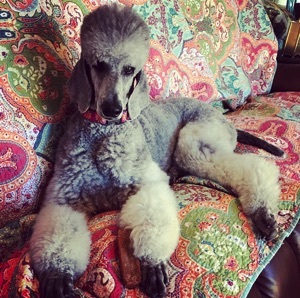 Jade is a silver standard poodle that is retired from Noir Poodles Breeding Program. She retired into a wonderful home that has one of her daughters. 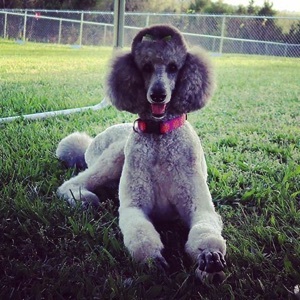 Jade produced gorgeous silver, brindle, and cream/white inter-variety small standard poodles with loving personalities. She is very regal and poised in the way she carries herself. Her coat is a beautiful silver color with a softer texture. Jade is 24 inches and 50 pounds. She is a wonderful therapy dog. Jade loves to visit nursing home residents with me, and the residents love her. Her personality is very affectionate and calm indoors. She also loves to play fetch. Jade is fully health tested, including genetic diversity VGL testing.